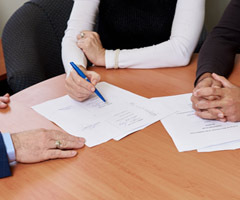 At Perth Mediation Services we have helped hundreds of separating couples reach financial and parenting agreements without the costly expense of going to court. Clients experience a lot of stress in their relationship breakdown and may even feel doubtful that mediation can help them through this challenging time. We understand this and are here to help you. We provide a professional, fair and non-judgemental mediation process along with the skills and expert knowledge required to relieve the burden of stress and find the optimum solution for both parties. No waiting lists and flexible appointment times are available. "John and Anna struggled to communicate with each other after their split 4 months ago. David was able to resolve their financial issues and negotiate a formal parenting plan for their 11 year old daughter Cassy." remains the same. Once initial contact has been made, we will contact both parties and discuss the best option for mediation. "I found David friendly, very processional and approachable. From the initial consultation to final written document took less than 3 months and I am very happy with the financial documentation."